Let Randy Curnow Truck Plaza show you how easy it is to buy a quality used car in Kansas City, Kansas. If you're looking for quality, pre-owned vehicles for sale in the greater Kansas City area, then simply give us a call! Welcome to Randy Curnow Truck Plaza, the pre-owned commercial division of the Curnow Auto Group. 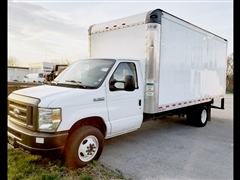 We specialize in light & medium duty pre-owned commercial vehicles and have the ability to locate, upfit, package & finance, your next work truck or van for your growing business needs. Have a build in mind? Ask us how to get it done! Buy with confidence. Our certified pre-owned vehicles have gone through stringent inspection and recondition processes to ensure that we deliver the highest quality vehicles possible. Not only are there more points of inspection than what the average dealer will perform on the average vehicle, but the requirements for passing these inspection points are stricter than any state mandated requirements and stricter than what most dealers provide. This translates to a quality pre-owned vehicle that is more mechanically and electrically sound than one that has not been through the same process. Buying a vehicle that is in great shape is just the first step. To keep your vehicle running optimally, and to minimize costly future mechanical repairs, our Certified Program also provides 2-years/24,000-miles of regular scheduled maintenance*. This takes care of several important dimensions of upkeep for your vehicle. -Oil and Filter Changes: The oil in your vehicle performs many key functions…lubrication, temperature control, removes engine wear particles/sludge, helps to maintain fuel economy and promotes longevity of mechanical parts. -Tire rotations: Many people will pass on getting their tires rotated to save on maintenance costs; however, rotating your tires regularly provides many benefits. It helps the tires to wear evenly. This prolongs the life of the tires, leads to optimal fuel economy and provides a smoother ride. Regularly rotating your tires can also prolong the life of your vehicle’s suspension components by reducing vibrations. In order to rotate your tires, the wheels must be removed. This gives the opportunity to look over the undercarriage components and catch any problems in the very early stages, which can save you money down the road. -Multi-Point Inspection: Information is power. Knowing the condition of your vehicle through regular inspections allows for you to catch potential upcoming maintenance requirements before they become more expensive repairs. If you wait until you feel the problem, additional damage to other components has often taken place. Our 172-point inspections will keep you in the know about your vehicle’s condition to help you prepare for future repair costs and save you money. -Courtesy Transportation: In the event that you have more lengthy service work that needs to be done, a Randy Curnow Auto Plaza Courtesy Vehicle may be provided to make certain you can keep your life rolling when your vehicle cannot. *Maintenance visits must occur within 2 years or 34,000 miles of purchase date, whichever occurs first. Maximum of 2 visits per year. Does not include air filters.